AfB is part of an environmental community enterprise. Hand in hand with our sister companies Mobiles Lernen gemeinnützige GmbH and Social Lease GmbH, these three organizations form the stable pillars of Initiative 500, a not-for-profit public limited company. This company has undertaken the task of creating 500 jobs for disabled men and women over the coming years. 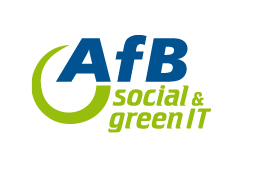 Socially responsible companies donate IT hardware which they no longer require to AfB gemeinnützige GmbH. The goods are collected, inventorized, and all data is certifiably erased. They are then tested, cleaned and finally marketed again with a warranty of at least 12 months. Setting up a not-for-profit company in the IT sector has never been done before. AfB was founded in 2004 by personally committed private individuals with a social focus. This social enterprise now employs a total workforce of over 200 in 13 locations in Europe. Half of those employed have a disability, and have been enabled to gain quality employment through the scheme. The company processes over 230,000 used appliances a year, and the tendency is rising. As well as creating 500 jobs for disabled men and women over the coming years, the remarketing of IT equipment will make a valuable contribution in terms of cutting carbon emissions. Remarketing PCs, notebooks and other hardware will help to reduce the need for separation of the raw materials used in IT appliances in third-world countries, which poses a risk to health and to the environment.